What is the best way to splice or join 2 sections of high tensil fixed knot without using gripples or connectors? Any pics or videos of knots or twist out there? Makes my hands hurt just reading it! 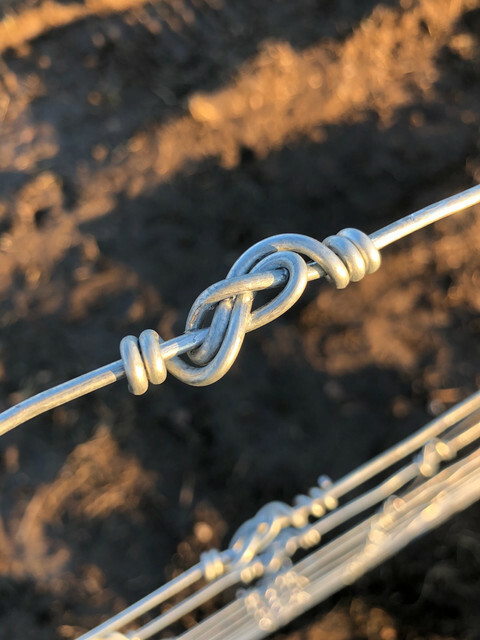 Maybe the pros will chime in, but if not using gripples, I would suggest a square knot. I use a crimp and then barrel wrap the wire on each side of the crimp. I'd like to see a square knot tied and then pulled tight using high tensile....from 50+ yds. We still use the western Union join with the vertical stays right next to each other and make your wraps so the stays prevent slipping. The " European" fencers will snort and stomp away with wedgies in their short shorts, but he'll they do that about most everything. I misread the post. My fault. I thought he was talking about barb wire. On the run I did last week I put two vertical stays close together and then did 5-6 tight wraps keeing them as close to the knot as I could. It held fine but was wondering how the pros do it. Gripples get expensive quick and keeping up with crimps is just more “stuff” to have. I also did the tight wraps on the ends instead of the high tensil slip knot. In the past I’ve always used the slip knot. Sounds like you're doing it right. On hightensil its easier to make that first wrap kinda long and lazy then four or five tight wraps. Once you get it going keep moving. The wire heats up and softens and wraps tighter. The zaberra tool, or any form of home-made similar works great. The gripples get expensive but I don't do enough fencing to make that much difference. For me it is a matter of convenience. The gripples are quick and easy. I see it the other way round. I fence for a living. The gripples pay for themselves in saved labor. Of course that has nothing to do with Lucky's question. Another factor. In this picture, I used the gripples to gut stretch. If I was paying folks by the hour I would go with the gripples but for me it’s just easier to tie the knots. One thing I am going to get is a stretcher bar. The bolting two 2x4’s together then wrastling with the 20’ long chain is for the birds. I’ve put up several stretches of less than 300’ but this was the first long stretch I’ve done. Think it was about 900’. I used 949-12 and a top wire but from now on think I’ll go with 842-12 and a top wire. Now I just need to get the stretching it tight enough to suit me down. 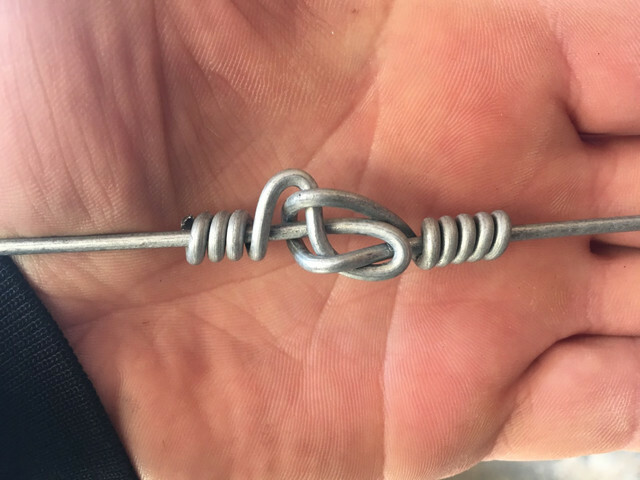 Figure 8 or speed knot will be the easiest and most effective. Tex Brown if you are tying under tension. A reef knot is easy to tie, but takes some babysitting as it comes tight. 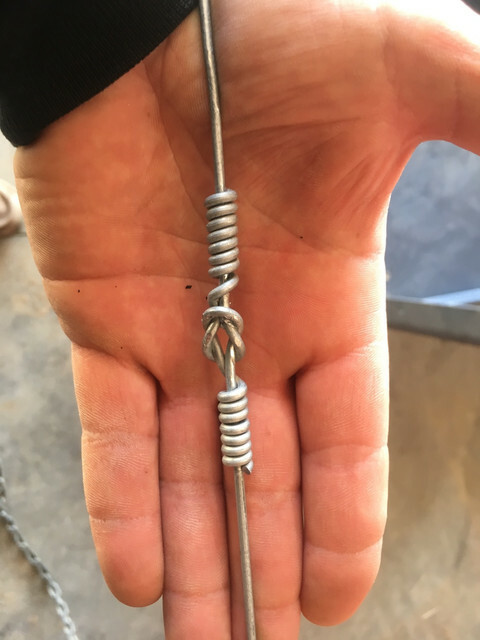 Crimps are cheap, quick, effective, and maintain 100% of the wire strength when used properly. Gripples are easy, fast, and effective. Nice looking knots. I’d like to see a video of the figure 8 knot being tied and tensioned on 949-12 if anyone has or knows of a link. Good to hear the crimps are effective. The farm store had the crimps but the tool to crimp them was $160, not sure I’d use it that much. I primarily use 12g barb wite for my fencing.